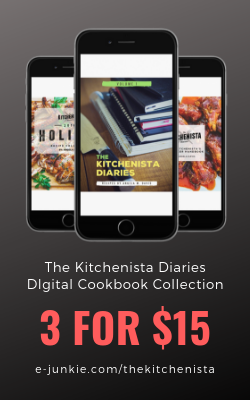 It dawned on me as I was preparing this post that my last few recipes have all been vegetarian and featured avocados, so I hope you guys love them as much as I do! Don't worry, I'll be back to bacon soon. I could seriously eat an avocado every day with nothing but a pinch of salt and pepper. That's a meal in itself for me. I once heard somebody describe them as a vegetable disguised as butter...could not have put it better, notwithstanding the fact that avocados are technically a fruit! 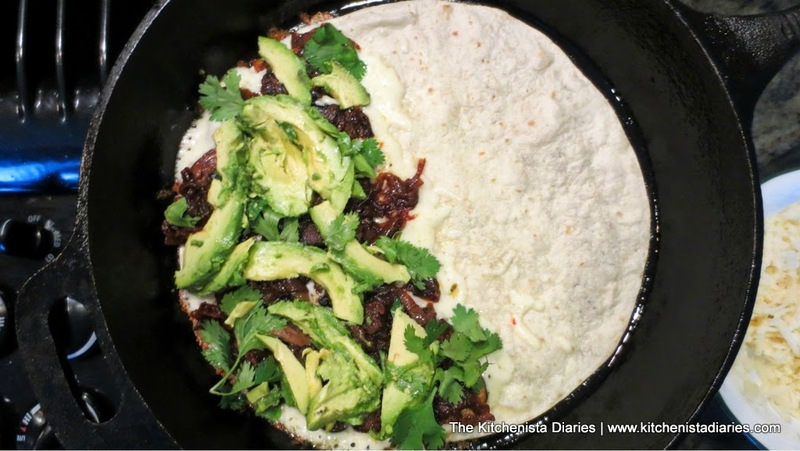 When it comes to quesadillas, I usually have some kind of guacamole or avocado crema on the side, but this time I thought, why not just put the avocado inside? The result is avocado in every bite and no awkward unnecessary dipping of the quesadilla. I also chilled my avocado before slicing it into the quesadilla which is a nice contrast with the other warm fillings. All win. 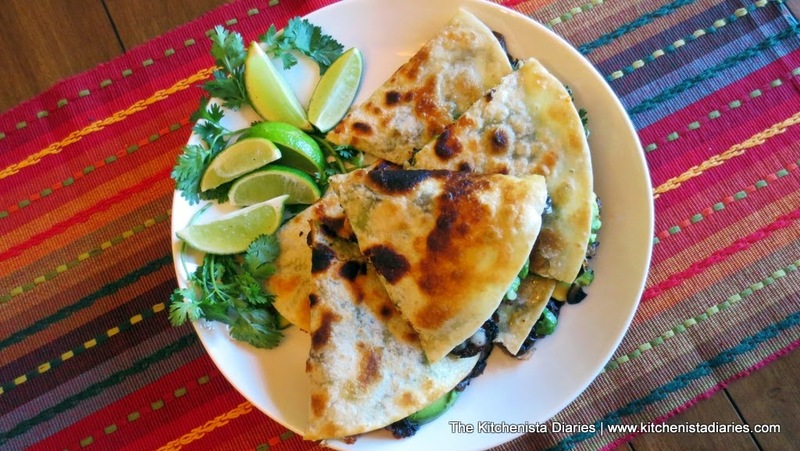 Quesadillas are all about "mouthfeel" as Chef Andrew Zimmern would say. A creamy, oozing filling sandwiched between a crispy pan fried tortilla? Heaven. Surprisingly though, the cheese is not really the star of this quesadilla. Avocados provide a cool creaminess, mushrooms add umami add a meaty bite, but the real show stopper is the onions. 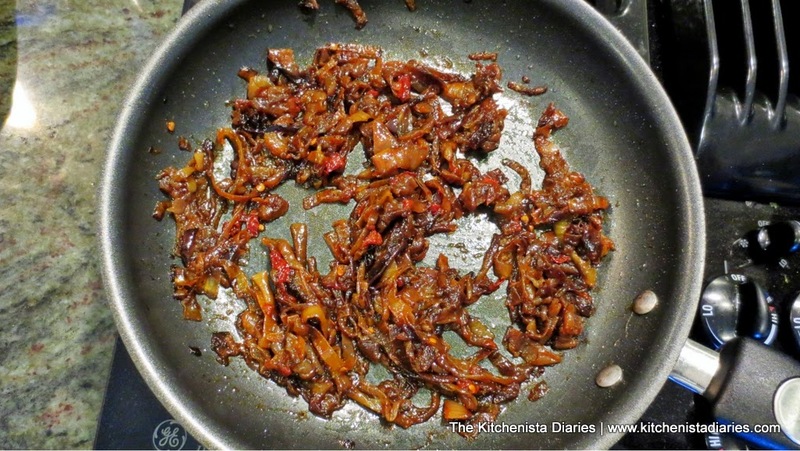 Chipotle caramelized onions. Let that sink in. I got the idea from my Chipotle Sweet Potato Tacos recipe, which also featured caramelized onions. This time I wanted to use a lot more onions and infuse them with the chipotle flavor. 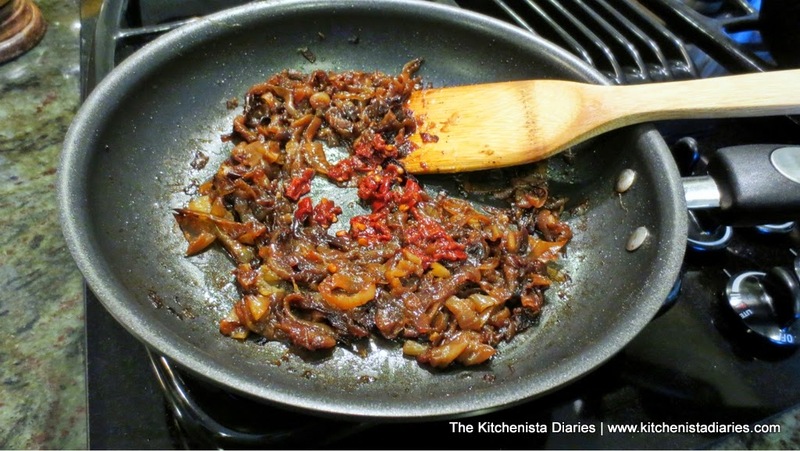 The result was deliciously tender, sweet, smoky and spicy onions with the characteristically sticky caramelization that makes them so irresistible. Because of the onions, this isn't a 10 minute meal, but it's pretty easy to make a batch of caramelized onions ahead of time when you have an hour to spare. My suggestion? Do as many onions as you can stand to slice up at once, take the time to caramelize them, then portion out and freeze or refrigerate them for use in future recipes. 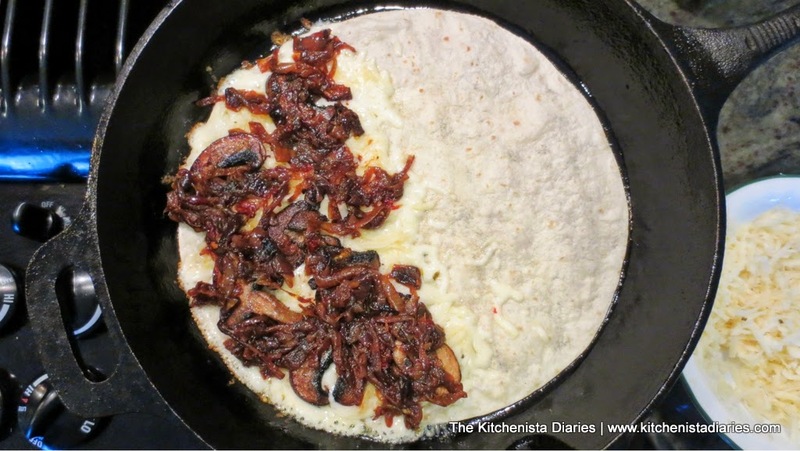 That way when you have the brilliant idea to add some caramelized onions to your next quesadilla, burger, sandwich, or whatever your stomach dreams up, they are already done. With a new baby in our home, that's definitely the route I'll be going from here on out so that I have one less thing to worry about at dinner time! As I mentioned above, the onions can definitely be the "do-ahead" portion of this recipe. My pet peeve with a lot of recipes calling for caramelized onions is that they rarely fill you in on exactly how long that process takes. I've seen a lot of dishes claiming to have caramelized onions that are really just sauteed or fried. Don't do that. If you only have fifteen minutes, caramelized onions just aren't gonna happen. But with a good chunk of time and a little patience, you'll be handsomely rewarded. Start out by slicing up your onions. 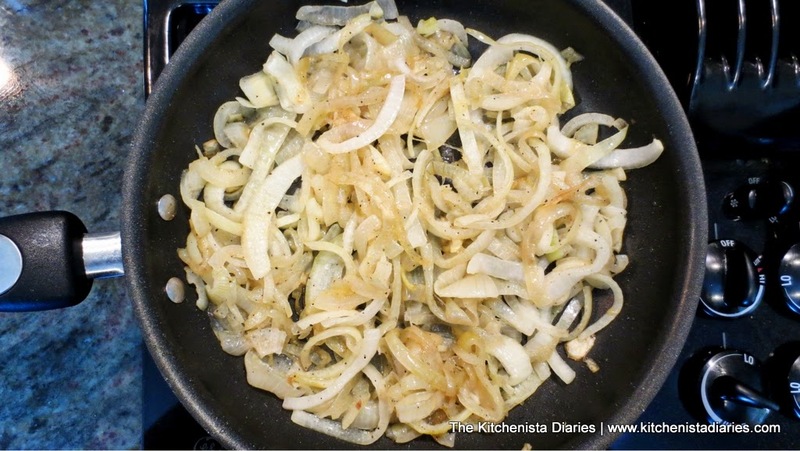 Warm a couple tablespoons of olive oil in your skillet over medium low heat and add the onions. 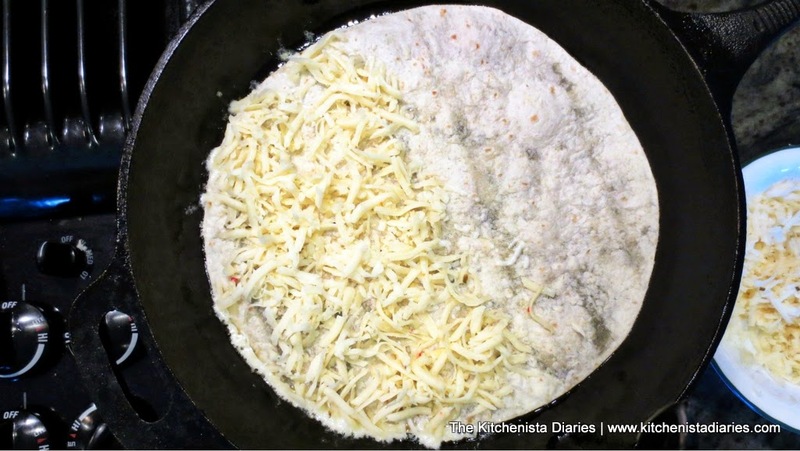 You can use the same heavy skillet you'll be using for the quesadillas later, you'll just need to wipe it clean before cooking the quesadillas. I used a smaller nonstick skillet instead. Up to you. Let the onions begin to sweat for a few minutes. As they soften, season with a heavy pinch of salt and cracked black pepper. The rest of the time is pretty low maintenance. Keep an eye on your heat, lowering if necessary. Stir every 5 to 10 minutes to evenly cook the onions and watch as the color deepens. After about 30 minutes, they should be tender and golden brown. 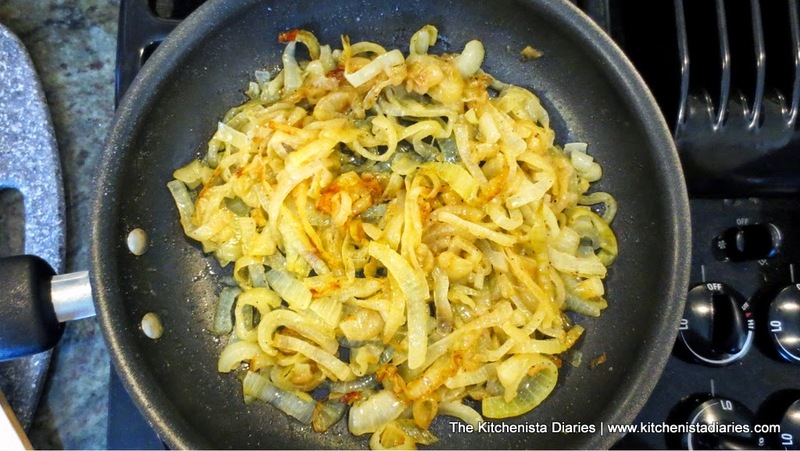 If the onions start to stick too much, add a few tablespoons of water to the skillet. Scrape up any brown bits developing in the pan - that's your flavor starting to build. After 45 minutes or so, you're almost there. You'll know because the onions will be mostly brown but still some translucent pieces remain. At this point I keep the heat at the lowest setting so they don't burn. 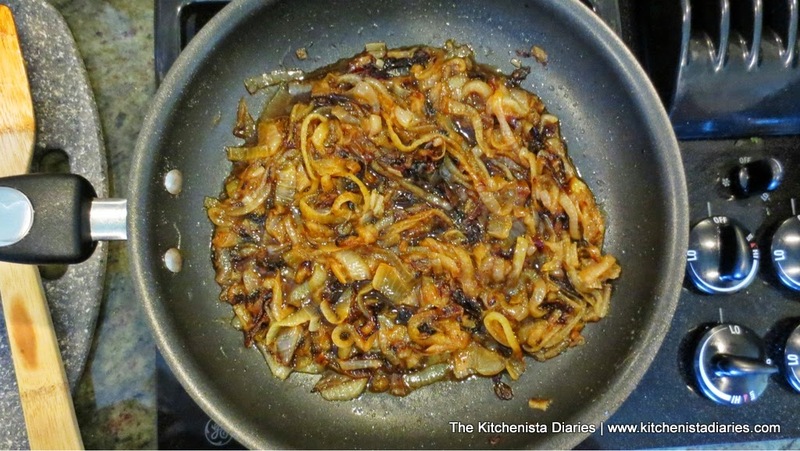 Around the hour mark, you'll have beautifully caramelized onions! Resist the urge to eat them straight from the pan. I'm so guilty of this. If you are smart and prepared a double or triple batch of onions, this is when you could go ahead and freeze some for later use. You'll want about a cup or so for this recipe. Now to turn these into the super special "Chipotle Caramelized Onions" you'll stir in a chopped Chipotle pepper and a little bit of the adobo sauce from the can. Yeah, that's it. I wish it was a little more exciting of a secret but I promise you, These Are Everything. If you like your food really spicy, throw in an extra pepper or more of the sauce. If you want a milder quesadilla, you might want to scrape out the seeds before adding the chopped pepper. 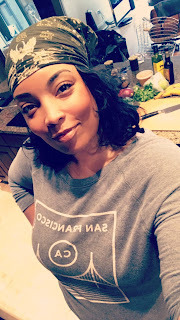 I use Chipotle peppers in many of my recipes, so be sure to browse around for more ideas to use up the rest of that can! 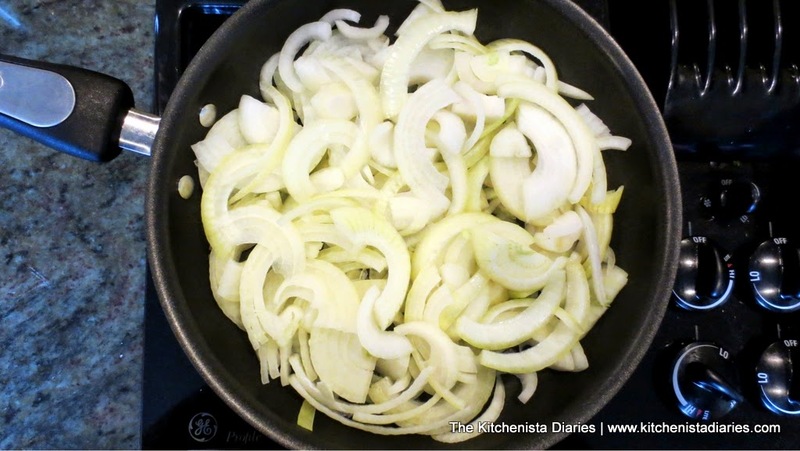 Remove the onions from the skillet and set aside. Increase the heat to medium high and add another good drizzle of olive oil. 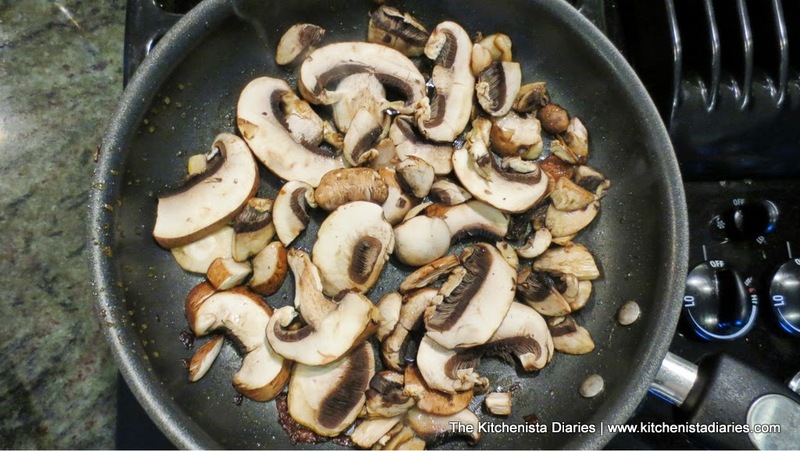 Add your sliced mushrooms. Let the onions brown for several minutes, turning a couple times. Allow them to get good and golden brown and develop a little bit of a crust just like you would if cooking meat. Season with a good pinch of salt, cracked black pepper, cumin and cinnamon. 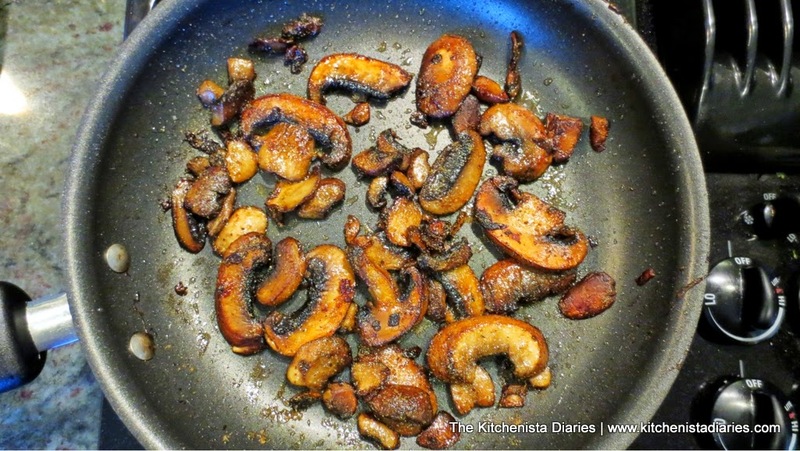 Squeeze a little lime juice to deglaze the pan, scraping up all of the brown bits. Now it's time to build your quesadilla. That delicious first bite is near! Either wipe out your skillet, or heat a large heavy skillet over medium high heat. Add a good drizzle of olive oil. Carefully place down the tortilla, it should sizzle a bit. Immediately cover one half with cheese. 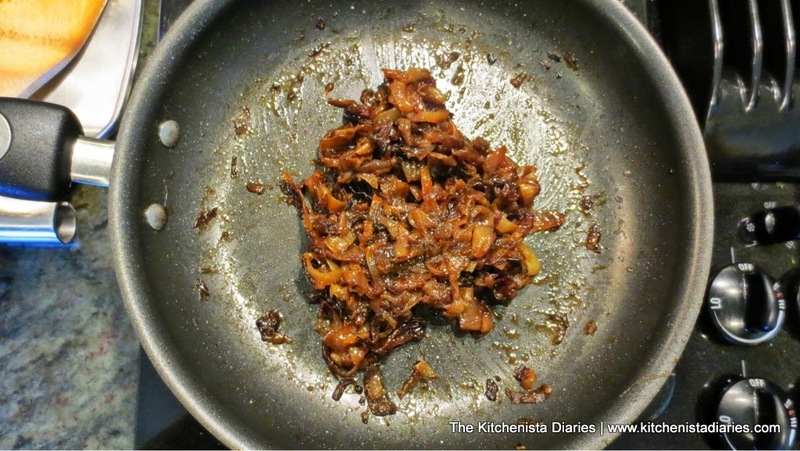 Cover the cheese with half of the Chipotle caramelized onions and sauteed mushrooms. 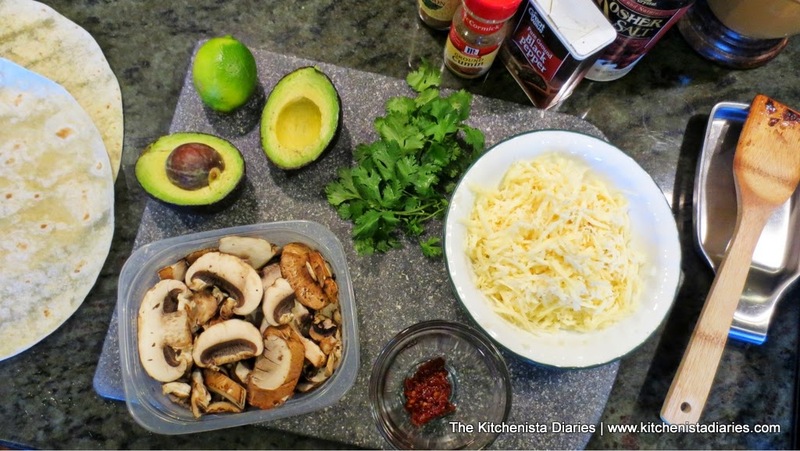 Then top that with fresh cilantro and half of the avocado slices. 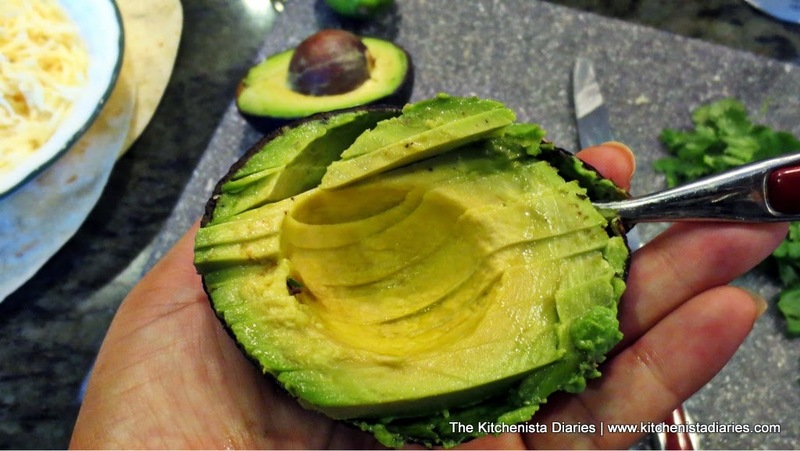 Carefully mash the avocados down just a bit so they stick. I also sprinkle a little bit of salt & pepper here so the avocados are seasoned. Sprinkle just a little bit of cheese on top of the avocado (helps the tortilla stick) then use a spatula to lift up the empty tortilla side and fold it over. Be careful, the tortilla will be extremely hot. Let the quesadilla cook for just another thirty seconds or so, then use the spatula to transfer it to your plate or cutting board. 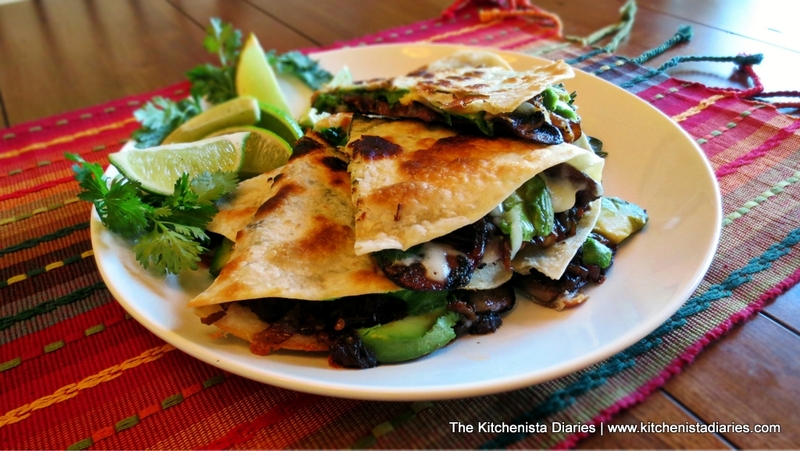 I love building quesadillas this way because there is no flipping necessary, which always inevitably results in toppings falling out all over the place. 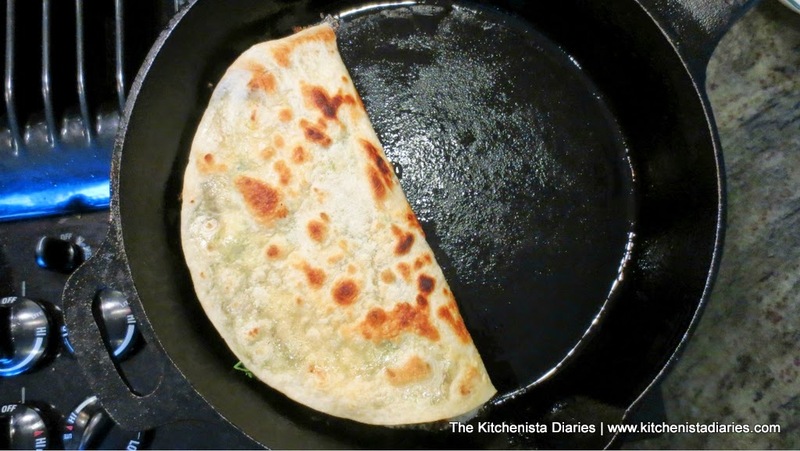 Grease the skillet again with a little more oil and repeat to build the second quesadilla. 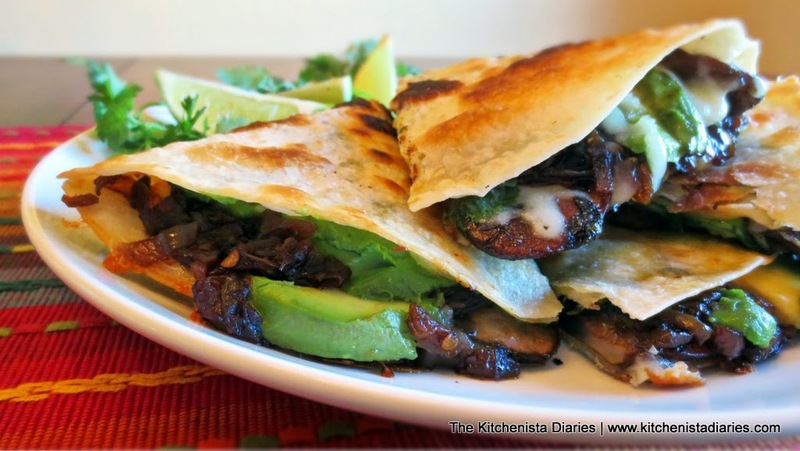 Use a sharp knife to cut each quesadilla in thirds, then serve immediately. As if I need to tell you that. Dive in and enjoy! I'm back! I dug into my archives for an appropriate Cinco De Mayo recipe and found this gem - it's a fun little appetizer that's super easy to make and perfect for any Mexican themed feast. Honestly, I'm embarassed by how many perfectly good recipes I have tucked away waiting for the time and inspiration to write up a full post. At any rate, I have a legitimate excuse for disappearing on y'all for a little bit...Baby Biscuit arrived! The end of my pregnancy turned out to be quite stressful due to a third trimester diagnosis of preelampsia and all the extra monitoring that goes along with that, but I am so happy to have a healthy baby girl in my arms now. 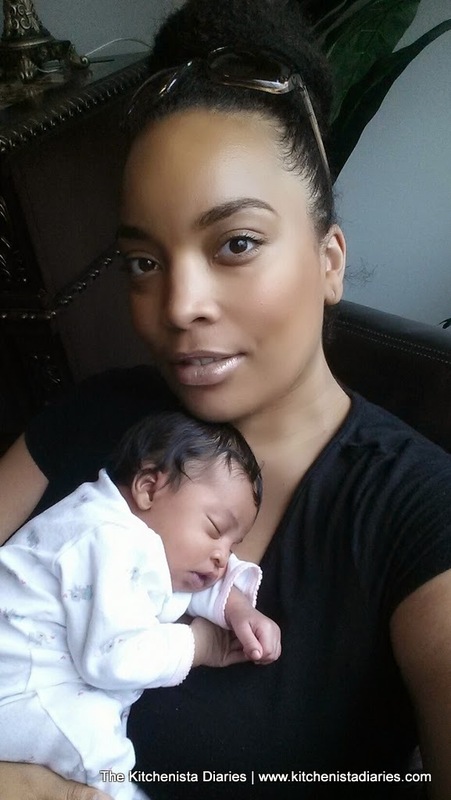 Raven Marie was born April 9th weighing in at 6 pounds and 15 ounces! Can I just say that with all the amazing food I shoveled in during my pregnancy I was a little surprised to deliver such a peanut?! Well, what she lacks in size she makes up in personality that's for sure. 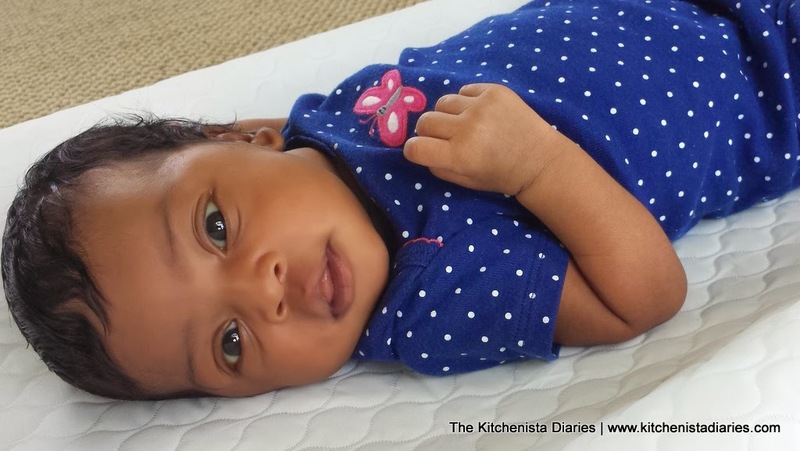 She has taken over the Davis household and captured everybody's hearts and attention. Who could say no to this face?! She's sleeping at this very moment - and not in my arms mind you, a rare daytime event - and it is all I can do not to wake her up just to get a whiff of that delicious baby scent. But work and productivity are calling, so here we are. Almost four weeks in and I am learning that if I don't take advantage of these little pockets of time throughout the day when I'm not nursing or changing a diaper, literally nothing else will get done. This includes eating and showering, because newborns are selfish. 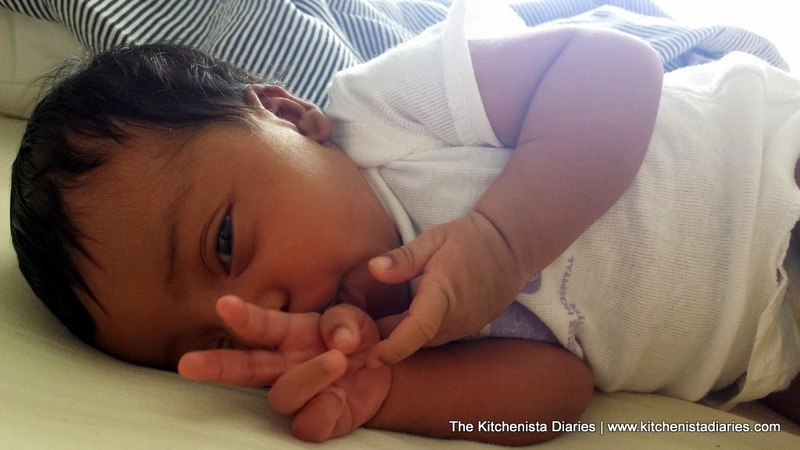 Seriously though, this little girl is amazing to me and I am relishing all the precious baby time. If there's anything I realize now when I look at my eleven year old son, it's that time goes by all too fast. Equipment Needed: Cast iron grill pan, or roasting pan. Preheat your grill pan, it needs to be just shy of smoking. If using the oven to roast your eggplants instead, preheat to 425°. You could always do this on a real grill outside if you already happen to be using one. Otherwise it's probably a waste to fire up just for a quick appetizer! Slice eggplants in half lengthwise and brush flesh with oil. Season with a good pinch of kosher salt and cracked black pepper. Mix together the chile powder, paprika, cumin, coriander, cayenne and cinnamon in a shallow dish and dip the eggplants, flesh down, to coat in spices. Brush your grill with oil and place eggplants flesh side down. Grill until fork tender, about 5 minutes depending on the size of the eggplants. You may need to do this in batches if all the eggplant halves don't fit at once. If roasting, drizzle a little oil in the bottom of your roasting pan and place eggplants flesh side up in the pan. Roast until tops are crisp and flesh is fork tender, about 15 minutes or so. Using tongs, turn the eggplants over. Top each eggplant with a small slice of cheese. Tent the grill pan with foil and allow cheese to melt while eggplants finish cooking, about one minute. Alternatively, if using a cast iron grill you can stick the pan under the broiler for a minute. If you roasted your eggplants, just take them out to top with cheese, then stick the pan back in the oven for another minute to allow the cheese to melt. The guacamole can be made in advance or while the eggplants cook, it just takes a minute. It's just a really simple guacamole, no frills. Scoop out the flesh of the avocado into a bowl and add some chopped cilantro, lime zest, a couple squeezes of lime juice, salt and pepper. I had enough heat from the spice blend on the eggplants, but if you want more, add a pinch of cayenne or even some finely chopped jalapeno. Mash that together with a fork until small chunks remain. Note, I didn't add the shallots in the guacamole because I wanted to use that as a garnish. You could certainly mix it all together if you're not going for a fancy presentation! After the cheese on the eggplants has melted, transfer them to a serving dish. Top each eggplant with a scoop of guacamole. Garnish with a little bit of the minced shallots, some finely chopped cilantro, and a dusting of cayenne pepper. These are amazing. The surface of the eggplant gets nice and crusty and charred from the grill and the inside is deliciously creamy. I'm salivating just writing this post and remembering them all over again! Well like clockwork, Raven has awoken from her slumber which means my time is up folks! Happy Cinco De Mayo, and please have a margarita (or several) for me! !